Scones | Oh, The Glamourous Life! You probably know by now that I’m terribly fond of tea, especially afternoon tea (That’s the one with the dainty sandwiches and tiny cakes. It’s not the same as high tea.). 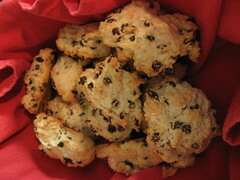 One of my favorite things, besides cucumber sandwiches and petits fours, is scones. My inspiration in all things culinary, the late Marian Walke, made fantastic scones and and I learned a few tips from her; however, this isn’t her recipe. For that you should get her cookbook War Fare. This is the batch I whipped up this morning. Preheat the oven to 350. Grease a baking sheet (or grease a foil- or parchment-lined baking sheet for easier clean up). Cut in the butter until the mixture is sort of crumbly. Add enough milk to make a soft dough. If it gets too wet, add a little more flour. Don’t beat too vigorously. The ingredients should be just combined. Turn the dough out onto a floured surface, knead just once or twice and pat into a disk about 3/4 inch thick. Cut with a 2 1/2 inch biscuit cutter (or the rim of a glass). Or divide the dough in two, pat into disks as above, and cut each one into 6 wedges. My preferred method is to drop heaping tablespoons onto the baking sheet. It’s faster and requires less clean up. Bush the scones with milk or a beaten egg yolk thinned with a little water. Bake for 20-30 minutes until tops and bottoms are lightly browned. Serve warm, or at room temperature, with butter, jam, and/or clotted cream. They’re pretty good plain too. Marian recommended using half all purpose flour and half cake flour. You can add an egg for additional richness, but you’ll probably need to reduce the milk. I usually use almond milk, since we don’t tend to have cow’s milk. It makes no difference in the taste. After brushing the tops with liquid, you can sprinkle them with sanding sugar. You can prepare the dough in advance, before adding the milk, though everything in a ziptop bag and refrigerate for up to a week or freeze for even longer. Bring the contents up to room temperature before proceeding. The next Boston Babydolls show is called A (Re)Movable Feast. Expect to see more cooking posts from me in the coming months.